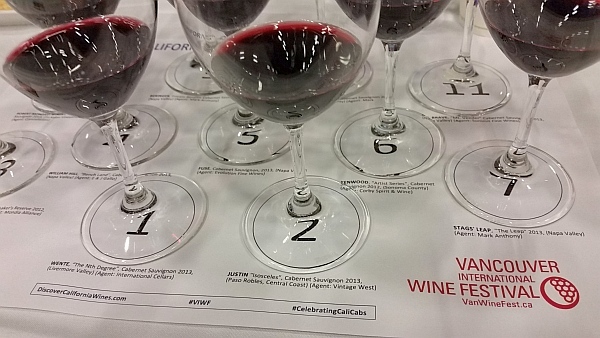 Did you know that Canada is the #1 country in the world that buys California Cabernets? I didn’t either. My guess was that China with it’s burgeoning middle class would be #1. Another first for Canada is that the first export market for California was BC in the 1970s! Our moderator for this seminar was Anthony Gismondi, who passed along these wonderful bits of information I have now passed along to you. Although many people talk about Napa Valley and Cabernet Sauvignon together, Napa Valley is one of the smallest wine-growing regions in the world; 1/8 the size of Bordeaux and produces only 4% of California’s wine grape harvest. 95% of its wineries are family-owned. 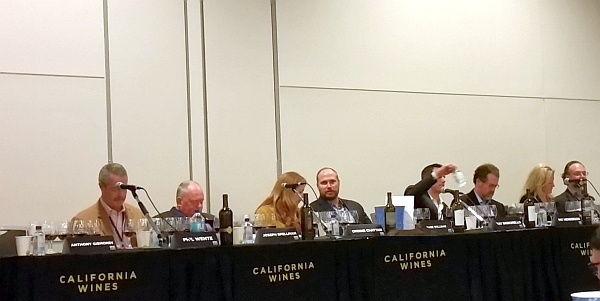 Ray Signorello from Fuse Wines noted that value Napa Cabs are now around the $70 range. William Hill Estate Winery “Bench Land” Cabernet Sauvignon 2013 ($80) – Bench Land is the bench that is up from the Napa Valley toward the Atlas Peak. The wine is 100% Cabernet Sauvignon. Only one other wine in this flight is solely Cabernet Sauvignon. All others are blends. This wine is inky garnet coloured. Medium intensity nose; a mix of pencil leads, cassis, dark fruits and vanilla. Full-bodied, round and spicy. Ripe cassis with vanilla on the finish. Firm tannins. A very dark, concentrated wine. Robert Mondavi Winery Reserve Cabernet Sauvignon 2013 ($155) – The grapes for this wine come from the famous To Kalon Vineyard in Napa Valley. The Robert Mondavi Winery views that great Cabernets have intensity and power, but also need finesse. This wine is opaque garnet in the glass. Dark fruit and nutmeg on the nose. Fuller bodied, with a silky mouth feel. High acidity and stronger tannins. Ripe dark fruit and cassis with spice on the finish. A wine that will age. Master of Wine, Mark de Vere, noted that 2013 was an epic year for Napa and you should buy and cellar this vintage. Geyser Peak Devils Inkstand 2012 – It is interesting that this winery has been in operation since 1880. The area of Alexander Valley in Sonoma, gets little fog, which is gone by 10am, and then they get good sunshine. The daily fog helps keep the grapes ripening steadily. The name of the wine comes from an inkstand there which is a steep-sided well so that the water looks black. This wine is mostly Cabernet Sauvignon, but has 2-3% Malbec in it as well. Opaque garnet. Medium minus nose, with aromas of capsicum, cassis and dark fruits. Medium plus body, round mouthfeel and medium acidity. Full cassis flavour along with pepperiness and light vanilla. Fine tannins. An elegant wine, that can still take another 8-10 years of aging. Jackson Family Wines Mt. Brave Mt. Veeder Napa Valley Cabernet Sauvignon 2013 ($125) – The grapes for this come from the Mt. Brave vineyard located above the fog line, which causes the berries produces to be half the size, compared to those on the valley floor. A blend of 82% Cabernet Sauvignon, 7% Merlot, 6.5% Malbec, and 4.5% Cabernet Franc. Inky garnet colour. Light intensity nose, with dark fruit aromas. Full-bodied, with ripe, round dark fruit, and light intensity sweet spices and pepper. Firm tannins on the finish. Also some minerality on the palate. The winery owns their own French cooperage which is quite amazing. Justin Vineyards & Winery Isoceles Cabernet Sauvignon 2013 ($118) – 75% Cabernet Sauvignon, 16% Cabernet Franc, 9% Merlot. To Joseph Spellman from Justin Vineyards the name of the blend of a wine is more important now than listing individual percentages of grapes. He felt that in the past listing grape varieties was important, but thinks we are moving away from that and toward names for certain blends. Isoceles is named in part as they use 3 different grape varieties in the wine. This wine is opaque garnet. Medium intensity nose, with cassis and sweet spices. Fuller bodied, with nutmeg, mineral and ripe cassis to start, then spicy and chocolate added on the mid palate. Fine but still firm tannins. Medium length. Kenwood Vineyards Artist Series Cabernet Sauvignon 2012 ($99.95) – A blend of Cabernet Sauvignon, Merlot, Petit Verdot, and Malbec. Each are fermented separately then aged 2 years in barrels before blending. The grapes come from 2 vineyards: Cariboo Ranch and Dry Creek Valley. Opaque garnet coloured. Medium intensity nose, of deep, rich fruit and cassis. Fuller bodied round with medium mouth feel. Nice mix of black fruit, cassis, vanilla and a hint of sweet spice. Also an enticing light floral perfume up front. Firm and fine tannins. Medium length. A wine with finesse; not overpowering. Rodney Strong Vineyards Rockaway Vineyard Cabernet Sauvignon 2013 ($99.95) – Is the Rockaway Vineyard named because it is very rocky? Maybe, but the real reason is that the owner is from the Rockaway area of Long Island. This wine is a blend of 81% Cabernet Sauvignon, 12% Malbec, 4% Merlot, and 3% Petit Verdot. Opaque garnet. Capsicum, cherries and dark fruits on the nose. Very tasty, fuller bodied. Nutmeg, spice, ripe dark fruit and chocolate flavours. Firm, drying tannins on the finish. A very nice wine. Fuse Cabernet Sauvignon 2013 ($72) – Grapes come from 3 vineyards, which are all estate fruit. A blend of 91% Cabernet Sauvignon, 8% Cabernet Franc, and 1% Merlot. The wine is opaque garnet in the glass. Dark, dusty nose, with cassis and a whiff of capsicum. Medium plus to full-bodied. Ripe, round and smooth, with ripe cassis flavour. Medium acidity and mouth feel. Firm tannins. This is their debut release of this wine! Beringer Private Reserve Cabernet Sauvignon 2012 ($140) – This winery has a long heritage with 2 brothers from Germany arriving in California and setting up their winery in 1876. A blend of 98% Cabernet Sauvignon, 1% Cabernet Franc, and 1% Petit Verdot. 50% of the grapes come from Howell Mountain which they say gives this wine its structure and muscle, and the other 50% from valley floor vineyards with softer fruit. Opaque garnet. Medium intensity dark fruit and vanilla nose. Full body, round and dry, with nutmeg and minerality. Ripe cassis flavour. Tannins kick in on the finish. Stags’ Leap “The Leap” 2012 ($87) – This is the only wine that is 100% Cabernet Sauvignon in our flight. The wine is deep garnet in colour. A hint of violets, plus dark fruit and vanilla aromas. Dry, medium plus body, with a round mouth feel. Firmer tannins. Ripe dark fruit, some violets and light sweet spice. Wente Vineyards The Nth Degree Cabernet Sauvignon 2013 ($120) – 80% Cabernet Sauvignon, 10% Petite Sirah, and 10% Petit Verdot in this limited release wine. The grapes comes from 2 vineyards, where each vine is hand touched 15-20 times per year and they try to keep the vines to 20-30 leaves. This wine has mostly ripe cassis together with oak and vanilla on the nose. Full and round, with sweet ripe cassis, pepper and firm, fine tannins. Vanilla on the finish. Medium length. Elegant, not overpowering. From my tasting of these wines, I can say that they are very ripe and richly flavoured, yet still have good structure and muscle. If you have the opportunity to purchase some California Cabs from the 2012-14 vintages, do not hesitate. Enjoy.